Marriott’s Kauai Lagoons’ accommodations are luxurious with a capital “L.” But the luxury experienced at Marriott’s Kauai Lagoons isn’t the kind of highbrow luxury with silk curtains, butler service and tea and crumpets served at noon. Not that there’s anything wrong with that kind of luxury, but it would probably be a little at odds with the hang loose lifestyle of Kauai. A villa at the Kauai Lagoons is more like a home away from home, except your home has a wall of folding glass doors that open the living room to an ocean view, sounds of the island, and an occasional chicken pecking in the lawn. Prior to arriving at Marriott’s Kauai Lagoons we had driven from San Diego to Los Angeles, flown from Los Angeles to Kauai, watched the Fourth of July fireworks from the rental car parking lot while we waited for our car, and been rerouted by the cops multiple times on our way to the Marriott Vacation Club property because of the fireworks. After a swift and easy check in, we quickly jumped over to the on-property restaurant, Duke’s Kauai, for dinner and a drink before the kitchen closed. So it wasn’t until late in the evening when we finally walked into our villa. Our villa was listed as an “island view” villa, but my research had told me that even “island view” villas have ocean views; they just aren’t “oceanfront” villas. We opened the door and we may have heard angels sing. I knew we had a two bedroom villa, but I hadn’t realized just how big it was going to be. The hotel staff had left the lights on for us so we could look around immediately. Knowing the room was facing towards the ocean, I was thrilled to see the wall of glass in the living room. The living room was inviting, and so large. As we further explored we found a fully equipped kitchen with sub-zero refrigerator, stove, oven, dishwasher, and any appliance you could possibly need. Not only were there stools along the kitchen island, there was also a long dining room table. The master suite faced the ocean and had its own door out to the patio. The master bathroom was huge with a large shower, a soaking tub, and two sinks. My favorite feature of the master suite? A walk-in closet! The second bedroom was also a very good size, though it didn’t face the ocean. It also had a bathroom which could be entered from the second bedroom or from the common area. As I snooped around some more, opening every door I could, I found a complete laundry room as well. While we normally don’t do laundry on vacation, after thoroughly muddying ourselves hiking the Kalalau Trail to Hanakapi’ai Falls, we were grateful for that washer and dryer. If you’re visiting Hawaii from anywhere else in America, chances are you’re going to be awake early. Morning is when the real beauty of a villa at Marriott’s Kauai Lagoons is revealed. There is an ocean view, but there is also a view of the hills along the water. The light along those hills in the morning is just spectacular. After folding back the glass doors to let the island air flow in, I relaxed on one of the lounge chairs on our patio and just watched morning begin. While it would be easy to stay on the Marriott’s Kauai Lagoons property all day, you’re probably not traveling to Kauai just to stay on hotel grounds. Another great feature of Marriott’s Kauai Lagoons is its location. The Kauai Lagoons is located in Lihue just below the airport, which means it’s easy to get to when you arrive (unless there were fireworks 30 minutes prior). Being located in Lihue also means you are close to a lot of great restaurants, both inexpensive and local and fit for a special night out. The Kauai Lagoons is located in between Kapaa and Poipu, both within easy driving distance, where you will find many of Kauai’s best restaurants in all price ranges. There are also a number of dining options on the Marriott property. As the Na Pali Coast prohibits roads from completely encircling the island, the Marriott’s Kauai Lagoons is at the midway point between both ends of the road, making its location perfect for exploring the island. For those of you who are golfers, the Kauai Lagoons Golf Club, designed by Jack Nicklaus and one of Kauai’s best golf courses, is also on the Marriott property. The Kauai Lagoons has its own pool, and there are barbecues and outdoor fire pits. The villas are on the same property as the Kauai Marriott Resort and Kauai Lagoons guests can also partake in the Resort’s amenities except for the pool and the beach lounge chairs. The Marriott’s Kauai Lagoons is a Marriott Vacation Club property, meaning timeshare owners stay there. But you don’t have to be a timeshare owner to stay at Marriott’s Kauai Lagoons. Villas can also be reserved just like a regular hotel room. Villas come with two or three bedrooms with beds and a sofa bed. The Marriott’s Kauai Lagoons is perfect for families or friends traveling together as everyone can stay in one villa but still have some privacy. 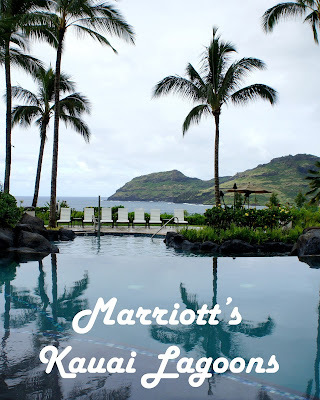 Thank you to Marriott’s Kauai Lagoons – Kalanipu’u for hosting our stay and making this post possible. As always, all opinions are my own.